This unflinching visual and literary tour-de-force tackles the most pressing issues of the day—including racism, patriarchy, gentrification, police violence, and the housing crisis—with humor and biting satire. When gentrification strikes the neighborhood surrounding Ronald Reagan University, Naima Pepper recruits a group of disgruntled undergrads of color to launch the first and only anti-gentrification social networking site, mydiaspora.com. The motley crew is poised to fight back against expensive avocado toast, muted Prius cars, exorbitant rent, and cultural appropriation. Whether Naima and the gang are transforming social media, leading protests, fighting rent hikes, or working as “Racial Translators,” the students at Ronald Reagan University combine their technically savvy and Black Millennial sensibilities with their individual backgrounds, goals, and aspirations. Juliana “Jewels” Smith is a writer, educator, and speaker. 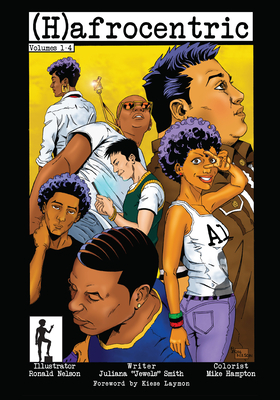 She is a Glyph Award winner and the honoree of the first annual Excellence in Comics and Graphic Novels Award from the African American Library and Museum at Oakland. Mike Hampton has been a self-published comic book artist and writer for more than 15 years. Ronald Nelson, who specializes in portrait drawing and sequential art, studied at School of Visual Arts, the Art Students League, and Cooper Union. Kiese Laymon is an award-winning black southern writer, the author of Long Division and How to Slowly Kill Yourself and Others in America.